Family wall plaques capture timeless moments and special occasions. They say you can't pick your family but what you can do is learn to enjoy the moments you share. Life is complex but when you have a positive experience together as a family nothing can break that bond. How can you capture those moments? Today it's about photos. I can't tell you how many times I have been asked to take a photo of my kids "After" they do something clever or cute. I even had a wedding photographer ask me to re create some of my most cherished memories of my wedding day. Jeesh!!! But I can say I don't regret having those photos and I certainly love looking at them whether they be in an album or hanging on the wall with a picture frame. 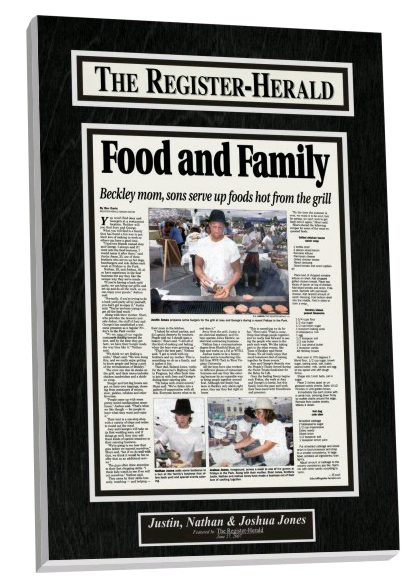 If you are looking for fun and new ways to mount some of your newest memories or you have a parent child moment In The News would like to be the place you come to do all of your family wall plaques. We are the alternative to framing. Our product is top quality. We want to get you thinking differently about your family digital photos. At In The News each plaque is crafted by hand and the company will use the latest state-of-the art equipment to do the job. To ensure that the photo or article does not deteriorate, it will be laminated and heat sealed and this produces a semi-gloss finish. Life nowadays can be hectic and it is very easy for the stresses of life to weigh you down such that you forget all about the good times you have had as a family. Mounting a wall plaque will ensure that your precious moments are not forgotten over the course of time. Old family stories can be stored and forgotten in a family album, but if you have a plaque mounted on your living room wall, it will be a daily reminder of the fun times that you have experienced as a family. You can decorate your home with a custom made item that is specially personalized for you. These items are perfect for your home decor, and the finish on each unique item is of the highest quality. Great designs are available and any room in your house will be spiced up by the wall plaque. The plaque will spark a conversation between your family and friends, and it is good for breaking an awkward silence in a gathering. The family wall plaques will still look good even after years of being placed on the walls of your home. This made to order item is a perfect addition to your home, and it is a beautiful way in which you can display the members of your family. The achievements that the family members have accomplished will be displayed for posterity. You can take pride in what your little girl has accomplished at school, or the sports achievements of your kids. Your pets can even be included in the plaque, and this makes a wonderful house warming gift that you can present to new parents. One can mount and preserve magazine articles if your family is always in the news. This provides a permanent display for a home or office. The best ideas are simple ones, and if there are good things that have been written about you or members of your family, then it makes good sense to promote such news. If you have a family run business and there is some positive news item that has been written about the business, it makes good business sense to promote the news item. This is a wonderful way in which you can promote the business, and new customers will be attracted to the business. Apart from taking pride in your business, you will also be increasing your profits by having family wall plaques mounted in your establishments. You can go to our feedback page and share your proudest moment with us.